We’ve been having pizza night on the regular here. There’s always a new fun twist that I’m coming across in my daily blog reads, and making a note to try. We’ve had weirdo winners in the past, so I’m always anxious to try different topping combinations that wouldn’t normally come to mind. I’d had this chicken ranch pizza from Annie bookmarked for too long, and finally gave it a spin last week when we had some extra chicken hanging out in the fridge. And, we have another winner! I went ahead and added bacon, simply because I had some of that hanging out in the fridge too. And really, when it comes to bacon – why not? I loved that that the sauce of the pizza was buttermilk ranch dressing.Kind of white pizza-ish, but far less heavy. I loved the tomato on top too. Tomato can be so good on pizza, if done right – but can easily turn into a soggy mess if overdone. Will definitely be putting this one into pizza night rotation from now on! A great summer pizza. Preheat the oven and a pizza stone to 500° F. Allow the stone to heat for at least 30 minutes. In the mean time, cut a round of parchment paper the size of your pizza stone. (Alternatively, use a pizza peel.) Sprinkle lightly with cornmeal or semolina flour. Gently roll out the pizza dough into a large circle, leaving a thicker ring around the edge for the crust. Spread the Ranch dressing in a thin layer evenly over the unbaked crust. Sprinkle with shredded mozzarella. Top with grilled chicken, tomato and green onions. Sprinkle with shredded cheddar. Once assembled, carefully transfer the parchment round and pizza to the preheated baking stone and return to the oven. Bake for 10-12 minutes, or until the cheese is melted and browned. Slice, serve, and enjoy! 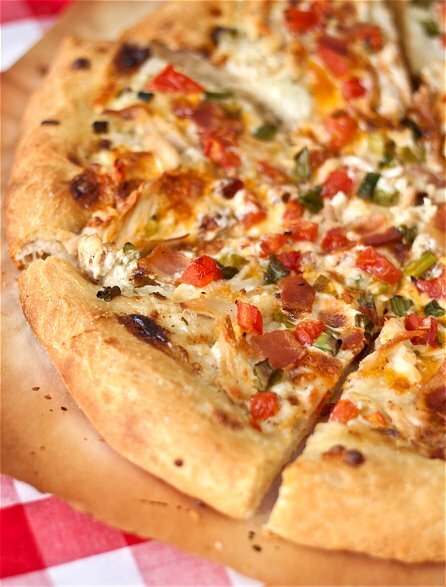 I love chicken ranch pizza, and this has given me a serious pizza craving!! This pizza looks delish! I don’t think I would’ve been brave enough to try ranch on it, but it looks and sounds really good. what size is the pizza dough? Hilda, about 14-inches round – but whatever thickness you like is fine. Whats the best brand of pizza dough to use?